Best cheesesteak truck I've had so far, the steak and toppings were cooked perfectly, and the bread held up great. 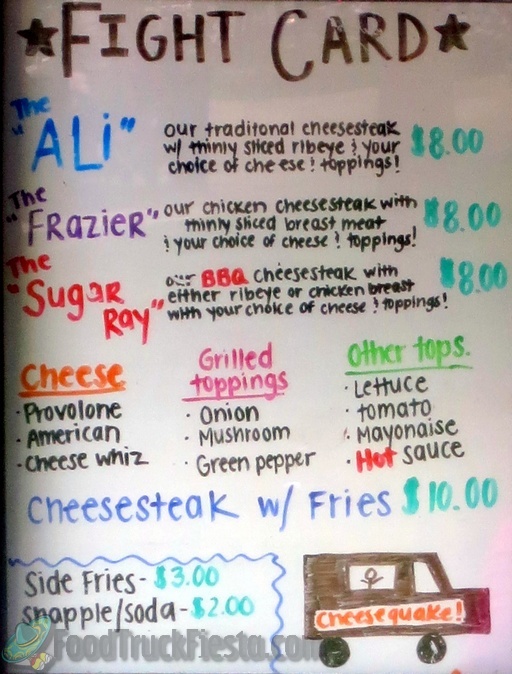 Other cheesesteak trucks I've visited have been bland. Very tasty sandwich, I would go this truck. I would have preferred my steak cooked medium but other then that no complaints on the sandwich. I would suggest cooking their fries a little longer, some of mine were soggy not crispy. It would be great if there was a hot pepper, like serrano peppers as an option. Also hot pepper cheese would be a nice addition. Very filling and tasty cheese steaks! This is definitely one of my favorite food trucks! I also love the variety of toppings and cheeses. Yummy! I went to school in New Jersey and worked in Philadelphia and over those years became familiar with really good cheesesteak sandwiches. This place got it right. The sandwich was great... real chunks of steak cooked just right and was not overwhelmed by the topping. The hot sauce just added to the taste, and as an added bonus, did not leave scars in my mouth. The only sour note was the fries. They were ok, but not up to par with the sandwich. Next time I will skip them. But the sandwich, the main fair deserves the six stars I tried to give. Too bad there are only five here. I am from Philly, so I am hard to please when it comes to cheesesteaks. These are the real deal!!! I have been there 3 times already. Run, do not walk, to this truck! Be hungry, because the Ali is stuffed with ribeye; VERY filling. I will go back again and again. Excellent service, quality ingredients prepared fresh, meat was juicy and had delicous flavor, I'll be back! If you feel a rumbling, it's me running to Cheesequake. I just love the flavor of the hot meat, the melted cheese, and the soft bun. I get the same thing every time because why mess with perfection. I really, really enjoyed this cheese steak sandwich. The meat was really tender. I asked that the bun be toasted, which I'm not sure happened. I'd prefer shredded lettuce, but the larger leaves were still okay. I will definitely visit again. 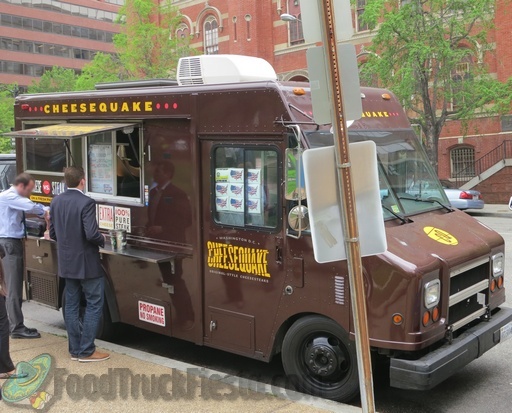 Cheesequake is a DC food truck that serves cheese steaks, sliders, and french fries.